With the power of art, The Grateful Heart Project will enable Calistogans to honor and commemorate the first responders, organizations, and individuals who fought the 2017 Tubbs Wildfire, protected our town, welcomed and aided our evacuees and their animals, and assisted the people who suffered losses as a result of the fire. We are creating art with heart-shaped, designs involving as many Calistogans in the process as possible, and we will present framed paintings honoring organizations and individuals for their work in honor of what they have done for us, as an expression of our gratitude. We're doing this with big thanks to Arts Council Napa Valley and the Hewlett Foundation for their support! A lot of work goes into the creation of art! 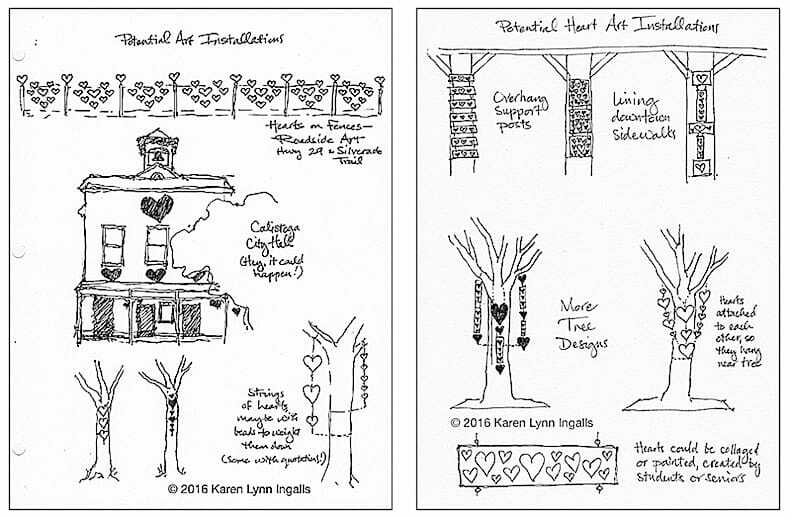 Here are some of the people and steps in the process of creation of the Tree Heart Art installations for Calistoga. Heart Makers creating Heart Art at the Calistoga Art Center, in January 2017. The Ingalls family, making Heart Art after Christmas dinner, December 2016. 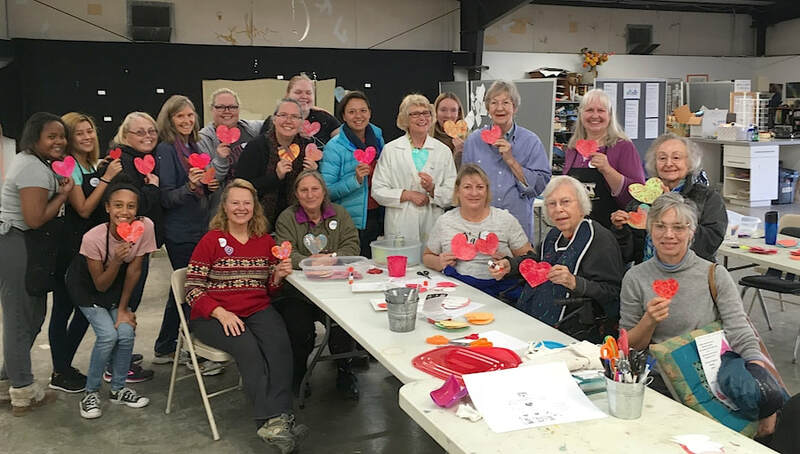 Heart Makers at the second Make-a-Heart Day in January 2017, at the Calistoga Art Center. 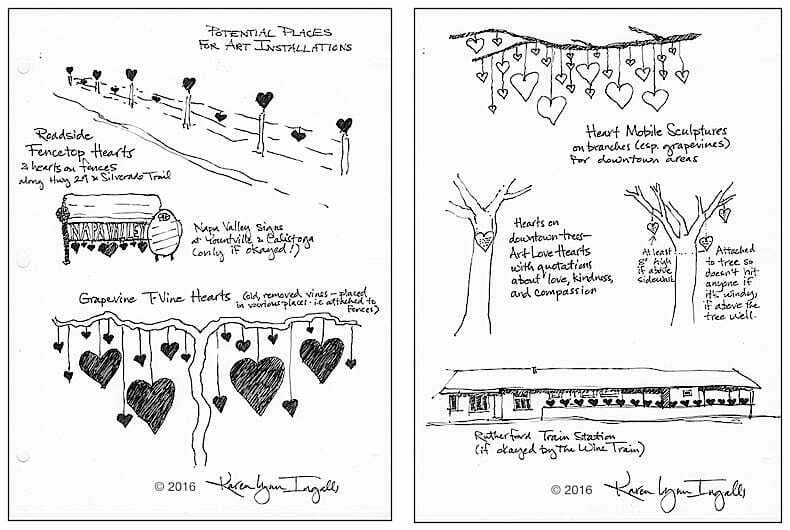 Each art installation along a three-block section of Calistoga's main street, Lincoln Avenue, will be placed in trees.... 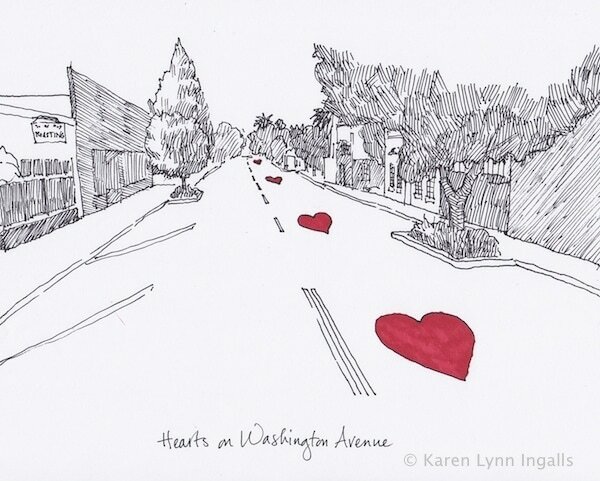 These will be smaller and more intimate than the roadside installations — just the right size to draw in and enchant people strolling by on the sidewalk — and include heart shapes, some with messages of love, kindness, and compassion. 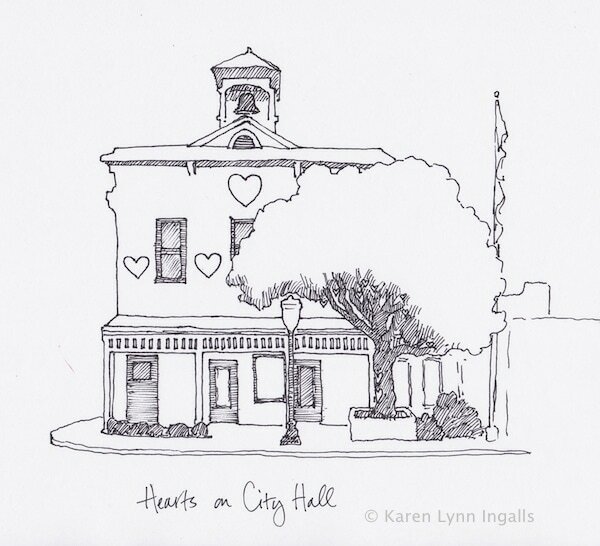 ​My designs for Calistoga also included placing hearts on City Hall (which was postponed, but should be going up before Valentine's Day in 2019); and, for Arts in April, hearts on the streets leading to the fairgrounds for ENGAGE Art Fair — we we didn't get the permit in time, but, who knows? Maybe next year...? ​The drawings below were my initial concept sketches. Although some of the plans evolved later, to suit the particulars of each location, they still form the essence of some of the installation ideas. ​As Highway 29 stretches south from Calistoga to Napa, there are many places where I envision art installations of hearts. This is an ongoing project, so, though it hasn't happened yet, it's still part of the vision.... There are some variations for each roadside installation, depending on the location, proximity of the fence to the road, and the kind of fencepost and method of attaching the heart images to it. ​Although the highway-side art installations won't be uninterrupted for miles, as was Christo's Running Fence, in Sonoma County in 1976, the Running Fence definitely provides inspiration for the project. ​The valley-wide vision of Hearts Across The Valley is that art installations of hearts stretch along the highways in as many places as is possible. Ideally, I'll be able to put up installations along the Silverado Trail too, but my plan is to start on Highway 29, at the Napa Valley Vintners' Napa Valley Sign south of Calistoga. ​The installation will extend both north and south of the sign, and across the road as well. In St. Helena, hearts and heart-making became a part of the music program at St. Helena Elementary School. Their spring concerts in 2017 were centered around the theme of love, kindness, and friendship; and visual installations of the hearts graced the entrance to the auditorium and the walls of the auditorium itself. Students created the Garden of Hearts at the St. Helena Boys and Girls Club, working with Boys and Girls Club Art Director Kari Martin, and each student, faculty, and staff member signed a blossom heart that was became a part of garlands stretching across three arches leading up to the auditorium. In addition, students worked together to create big heart collage artwork that teachers made into posters, each with the word for Love in a different language — those posters graced the walls of the auditorium for the spring concerts, and remained up for the rest of the school year. In the 2017-18 school year, the music program's theme became "Viva la Musica!" and dancing musical notes were added to the Garden of Hearts and the Blossom Heart Garlands, which remain at the school and are much beloved. 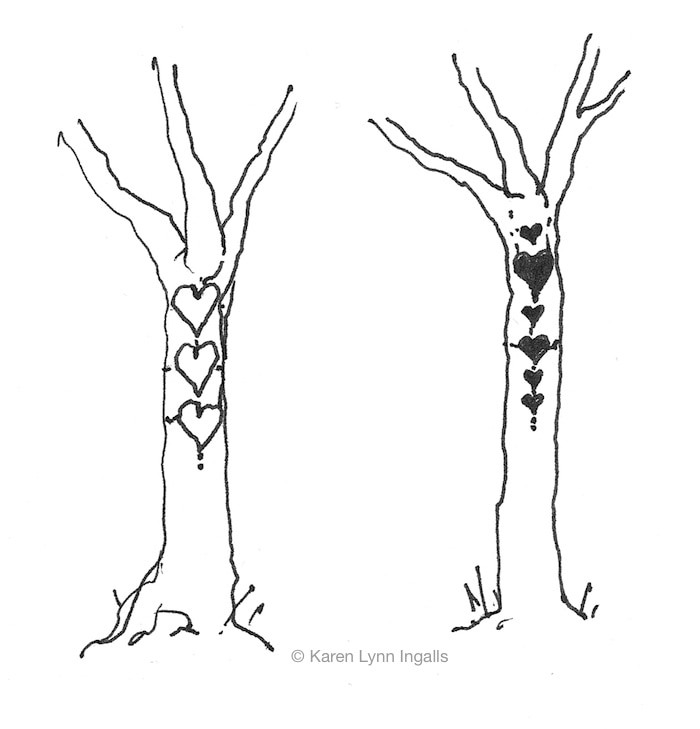 What will these Art Hearts look like? Besides the question of the design of each installation, there's the question of what the hearts themselves will look like. In town, they'll be seen by passers-by walking along the sidewalk, and each individual heart can be beautiful and complex in ways a roadside installation can't. They will include original art paper designs, digitally altered designs, some with inspirational quotations and messages of love and compassion, and some handmade designs created by participants — children, townspeople, friends, supporters, and community members. I've been sketching out my ideas, researching materials and methods, gathering materials for my initial prototypes, priming wooden shapes, creating prototypes, and testing prototypes in winter weather to see how they'll hold up. I've made fifty-one heart sculpture armatures, in different sizes, and used both original and digital art techniques to create art papers and hearts. 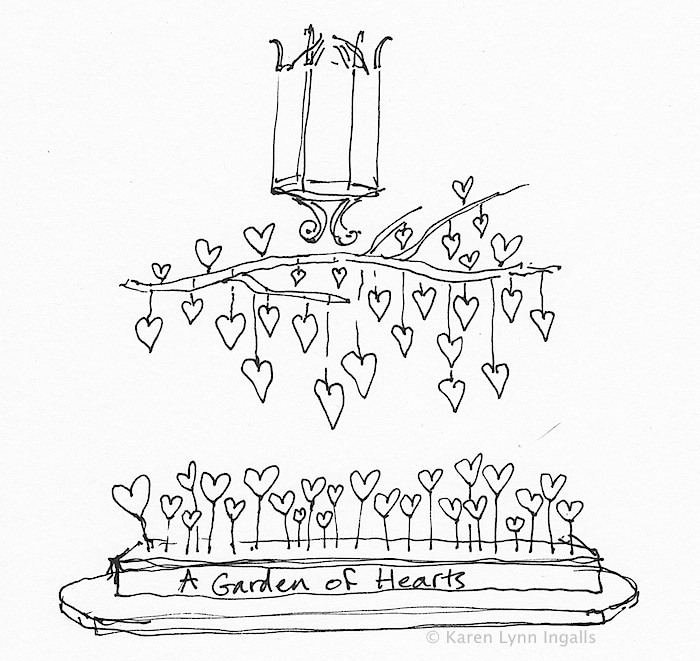 I've made heart stencils in different shapes and sizes, and drawn different arrangements and layouts of them on the page. I've created painted papers, using acrylic painting, collage, and relief printing, and then I've redesigned many versions of each of them digitally, to create the hearts from. I've made lots and lots of versions of designs and paintings, and watched them evolve as my ideas grew. I've rounded up quotations about love, kindness, and compassion, and translated "We love you" into every language that Google translates (including English, that's 103, by the way). I've measured the width of trees and overhang support posts along Lincoln Avenue, Calistoga's main street, and counted just how many there are of each. I've scouted highway locations, brainstormed possibilities, counted the number of fenceposts, and measured the post's heights and distances from each other. I've also introduced this to a number of people and organizations, throughout the valley — in Calistoga, St. Helena, Rutherford, and Yountville, and Napa, including Calistoga's City Council — and am creating activities for community members of all ages and skill levels to be able to participate in it, so that participants are able to, visually, at least in some small way, share their message of love to the world. 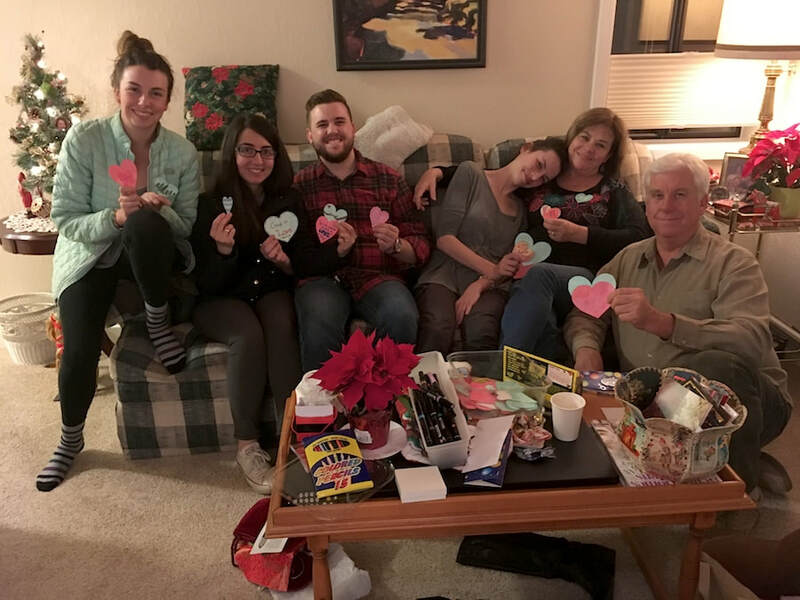 My first participating heart-makers have been my family, making their own hearts after opening our Christmas gifts. The third heart-making session is scheduled for the end of January, and slowly, surely, we're going to spread love, and art, across Napa Valley. As I refine the designs for each location, settling on the types, amounts, and costs of materials needed, I'm developing budgets for each location. And now I'm creating this website and its corresponding Facebook page, which will track how it all evolves.